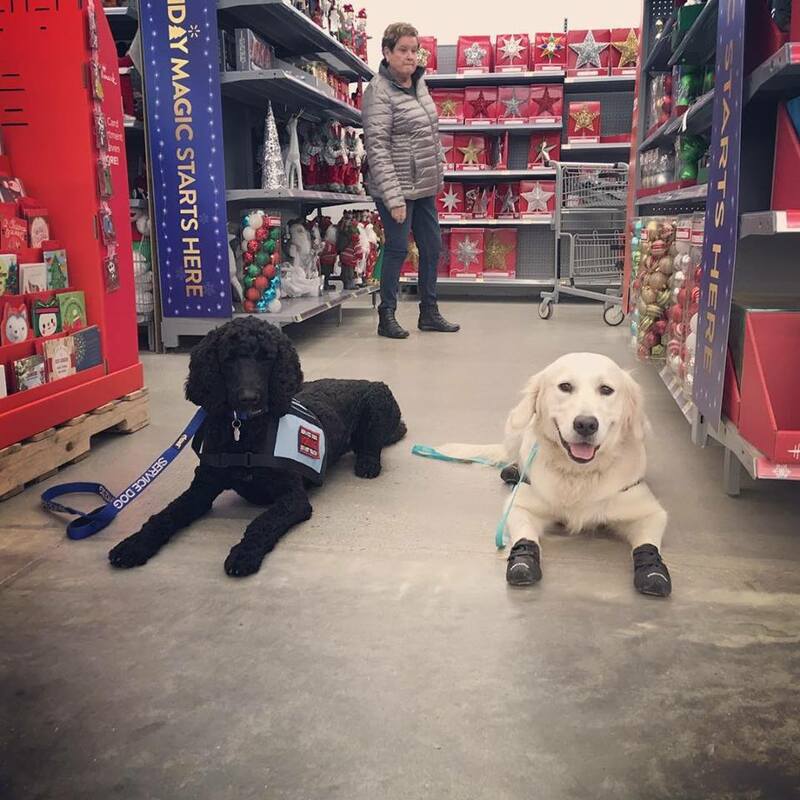 Mobility assistance dogs - a special type of Medical Assistance Dog primarily trained to assist their disabled handler with locomotion (defined as moving from one place to another by any means, including on foot or in a wheelchair). Mobility Dogs help people with impaired balance, gait, or coordination to safely walk or regain their footing after a fall, and they help individuals who utilize crutches or other assistive devices, including wheelchairs, gain unprecedented levels of independence, freedom and mobility. Psychiatric service dogs - A psychiatric service dog is a specific type of service dog trained to assist their handler with a psychiatric disability or a mental disability, such as post-traumatic stress disorder, schizophrenia, depression, anxiety, and bipolar disorder . Cross Trained Service dogs - a dog trained specifically to the clients needs. Please contact us and let us and we can work together to fit you with the right dog. We also provide and train therapy, skilled companion and facility dogs. Please contact for details. Please note that there is no legally required certification for service dogs in Ontario. Many of the websites claiming to "certify" service and therapy dogs are scams. Due to this we do not offer a certification for our program dogs but do adhere to ADI standards and will have our program dogs certified should the laws change. Completed Service dogs: Our service dogs are raised specifically for this type of work from 8 weeks to 1.5/2 years. They are pubic access trained and we teach specific tasks relating to the need of the client. These dogs are fully vetted, spayed/neutered, micro chipped and health tested. They have completed all temperament tests and advanced obedience training required for public access. They come with lifetime support. Skilled Companion dogs: Our skilled companion dogs have gone through the same training as our service dogs with the exception of public access.These dogs make excellent skilled family pets as well as therapy, facility or emotional support dogs . These dogs are fully vetted, Spayed/neutered, micro chipped and health tested. They have competed all temperament tests and advanced training. They come with lifetime support. See below for the dogs currently in training. We offer select packages for owners who have already chosen a dog or already have a dog they would like to train as a service dog. Public access training: This package includes 3 to 6 months of public access training for any dog over 6 months old that passes our temperament test requirements. It includes advanced obedience and public access training. The dog will stay onsite with us during the training and will have bi-weekly meetings with the handler.